In the future, the homeless shall beg you for a spare pinky instead of change. 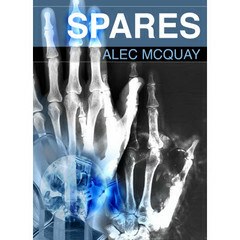 If you’re looking for something bizarre and amazing, something between a horror vein and a real new twist on science fiction, check out “Spares” by Alec McQuay and published by Fox Spirit Books. That’s Alec with a C, not X. Taking place in a world after a viral-war, no one dies. Everyone lives forever. But to get by, they need fresh body parts grafted on. The description I gave to this story is ‘fleshpunk’, a biological twist on William Gibson’s cyberpunk. If you like horror, unusual sci-fi or just a damn fine story, check out McQuay’s tale. Available in EPUB/MOBI format at Wizard Tower Books.